95 by 76 in. 241.3 by 193 cm. 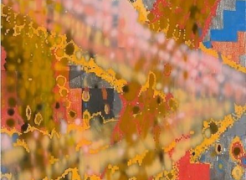 Mitchell-Innes & Nash is delighted to present our first exhibition of work by Brooklyn-based painter Keltie Ferris. 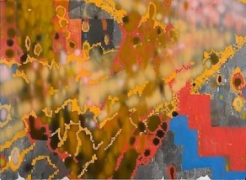 The exhibition, on view from November 29 – January 12, will include a dozen large-scale paintings made over the past year, using oil, acrylic, and hand-made spray-paint. Ferris has been called a “restless formalist,” and her exuberant paintings draw from a wide and varied vocabulary of marks, gestures, and references. She synthesizes allusions to divergent schools of painting, from pop to abstract expressionism to graffiti, into a riotous fusion unmistakably her own. The visual cacophony of Ferris’s paintings belies their rigorous and complex composition. 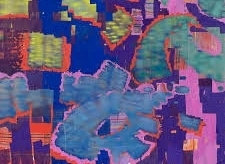 They function as palimpsests, with each distinctive layer partially obscuring the one below. These painting-strata remain distinct from each other, rather than resolving into one cohesive and flat picture-plane. This layering suggests the possibility of infinite paintings under the surface, as though the finished work is just one variation among many. Glowing, spray-painted marks seem to float or hover above the structured, geometric shapes below, giving the illusion that if you relaxed your eyes the painting might come alive and float free of its two dimensions. 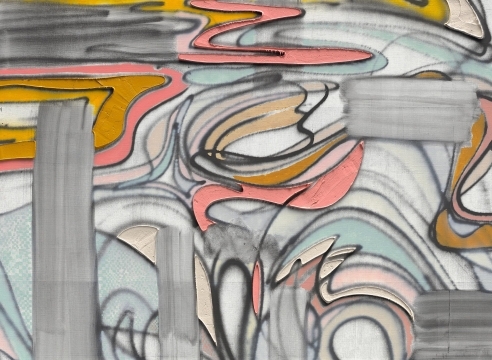 A formal tension in Ferris’s work exists between types of mark-making: fields of spray call to mind a quasi-photographic, Richterian blur, while scraped-on graphite and textured lines of oil pastel bring the paintings back into a non-objective realm. 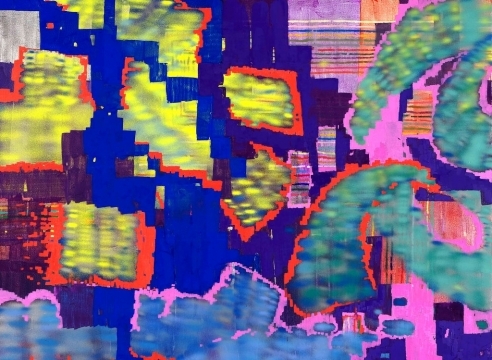 Her marks refer to digital images even as her paintings are manifestly handmade. They seem acutely concerned with ‘resolution’ as it pertains to the quality of digital information, but also as it describes degrees of finish or completion. This notion of resolution also speaks to the fact that one’s eye cannot rest and ‘resolve’ these paintings. Ferris’s compositions often feature large shapes that suggest characters of some unknown alphabet. Others call to mind a maze or territory, giving the barest hint of narrative. Their slippery structure pushes encounters with Ferris’s work past the ‘merely’ formal, into something more active. 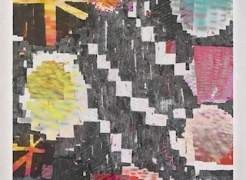 The paintings ask to be fully engaged, even as they defy interpretation. 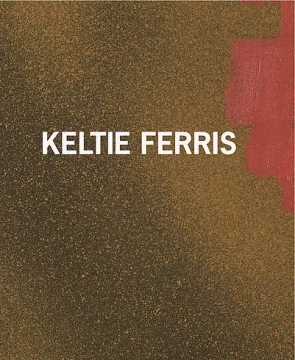 Keltie Ferris was born in Kentucky and lives and works in Brooklyn. She received her MFA in 2006 from Yale University in New Haven, CT and her BFA in 2004 from Nova Scotia College of Art and Design (NSCAD). Her solo show Maneaters was on view at the Kemper Museum, Kansas City, MO in 2009. In addition, her paintings have been included in group exhibitions at institutions around the country, including The Kitchen, New York; The Addison Gallery, Andover, MA; the Nerman Museum, Overland Park, KS; and the Indianapolis Museum of Art in Indiana; in addition to galleries in the U.S. and abroad. She is the recipient of both a Jacob Javits Fellowship and a Rema Hort Mann Foundation Grant.